Jerry Pournelle's blogpost discusses the treasonous nature of Major Nidal Malik Hasan's actions and the criminal oversight of the U.S. military of Hasan's anti-Americanism and pro-jihadism. Pournelle gets it exactly correct. This was treason. It was overlooked due to political correctness in the military. We can only hope that Hasan survives so he can be charged with treason in a military court. "...we're scrupulously nonjudgmental about the ideology that drives a man to fly into a building or self-detonate on the subway, and thus we have a hole at the heart of our strategy. We use rhetorical conveniences like 'radical Islam' or, if that seems a wee bit Islamophobic, just plain old 'radical extremism.' But we never make any effort to delineate the line which separates 'radical Islam' from nonradical Islam. Indeed, we go to great lengths to make it even fuzzier. And somewhere in that woozy blur the pathologies of a Nidal Malik Hasan incubate." I'm still sickened on many levels over the massacre at Ft. Hood post in Texas on November 5, 2009. Where to start? Backstabber - Baldilocks uses the term "backstabber" for Nidal Malik Hasan,and writes: "...this incident takes us back to when another Muslim called Hasan turned on his fellow soldiers. Recalling that, I began to wonder how often U.S. military have turned their weapons on those who trusted them most." - I'm dumbfounded by the incredible negligence of the U.S. Army that kept and promoted Major Nidal Malik Hasan, given the many warning signs over years. Read this NPR transcript, which discusses Hasan's statements at a Grand Rounds at Walter Reed hospital: "Hasan apparently gave a long lecture on the Koran and talked about how if you don't believe, you are condemned to hell. Your head is cut off. You're set on fire. Burning oil is burned down your throat." The staff was very concerned, another Muslim doctor objected to what Hasan said, and nobody does anything? Hasan is later promoted to Major? Treason - Jerry Pournells gets it exactly correct: it doesn't matter if Hasan was "a crazy guy who happens to be Muslim." What matters is that political correctness in the military allowed this horrible massacre to happen. "In the midst of the barbeques, the fireworks, and the fun, remember those who cannot be with their families because they are fighting to defend the unalienable rights enshrined in our Declaration of Independence - life, liberty, and the pursuit of happiness. Because of their efforts, freedom is now more than a distant ideal to millions of people around the world." "Please take a few moments to express your gratitude to an active duty soldier or veteran by visiting Show Your Support, an online resource by the Department of Defense. And share this message with your friends and family so that the cost of our freedom will not be forgotten." Apologies for not posting this yesterday. I thank all the veterans for their military service and sacrifices during wartime, including my father and his four brothers. Honoring those who serve and defend America is something we should do every day. Veterans Day is a special time to reflect on the sacrifices that have been made and are being made by brave men and women to preserve Western civilization. Here is a short tribute to watch. But we can also do something tangible. We can make a gift. Operation Gratitude and Soldiers' Angels let those on active duty know we are thinking of them and appreciate the sacrifices they are making. Help Hospitalized Veterans assists the seriously injured with motor skill recovery through creative arts and crafts. Injured Marine Semper Fi Fund helps with the rehabilitation of some of our bravest. There are many other worthy support groups from which to choose, almost all of which enable contributions, large and small, to be made online. Excellent advice from a blogger who works at the Walter Reed hospital. "The Ten Life Lessons from the Army" were originally printed here, and reprinted here. The advice covers pragmatic things ( "Always have a notepad, pen, watch, knife, and flashlight on hand") to much grander stuff ("Don't tolerate oppression"). Hat tip to Business of Life. Teresa of Technicalities attended the Milblog conference in DC this past weekend. Check out her blog, she'll be writing more about the conference over the next few days. The first thing she wrote about was Soldier's Angels, an organization whose mission is "to provide aide and comfort to any of the armed forces and their families." Sounds like a wonderful organization, you can donate money online or send $$$ to: Soldiers Angels, 1792 E. Washington Blvd Pasadena, Ca 91104. You can also Adopt a Soldier, which requires that you "commit to sending a card or letter a week and AT LEAST 1 or 2 care packages a month. This is important to help bring home a healthy hero. Care packages do not have to be expensive and you can put together your own. Duration of adoption is usually 6 to 8 months." This is a concrete and caring way to support our troops serving overseas, one soldier at a time. .... you'll love this short video over at LGF. Watch the whole thing! "...the dictator Kim Jong-Il told the Chinese envoy in Pyongyang that he has called it off for the foreseeable future. The truth could be anything -- from, the Chinese told their client enough is enough, to, there was never a second test ready anyway.... But the most likely explanation is that counter-threats and actions from South Korea, Japan, and the United States have persuaded Pyongyang that the cost of further testing is too high." Diplomatic maneuvring at the UN and appeasement talk don't defuse internationational crises. "Clarity, of the sort the U.S. secretary of state, Condoleezza Rice, was delivering in Tokyo this week, is instead what defuses crises. It was clear enough, from Ms Rice’s language, that the U.S. was taking North Korea’s threats deadly seriously. She said explicitly that the U.S. was prepared to use nuclear weapons to defend Japan and South Korea. Moreover, a real sampling of that seriousness was offered for Pyongyang to taste. Aid, vital to the daily operations of the "hermit" regime, was being cut." Japan and South Korea both stood firm against North Korea, which is a bit of a sea change for those countries. 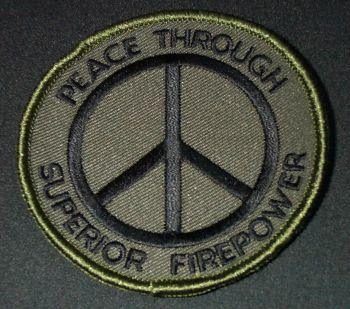 "Unfortunately, our Western “gliberal” elites, and the media that express their fantasias, actually believe that peace is advanced by consistently appeasing our most lethal enemies, by "talking nice", and giving them interminable assurances of our harmlessness. Whereas, that is the formula for inviting attack. Peace between irreconcilable parties can only be delineated by lines in the sand." Life, Liberty, Etc. 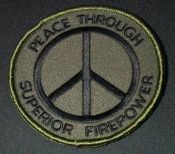 has quite an array of "Peace Through Superior Firepower" products, including T-shirts, pins, stickers and patches.